How the 'Bronte Sisters Photo' is linked to a photo at the Bronte Parsonage Museum. 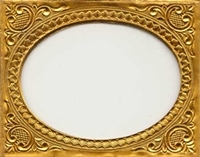 When photos on glass were produced in the 1850s they were placed in a frame with another piece of glass in front. 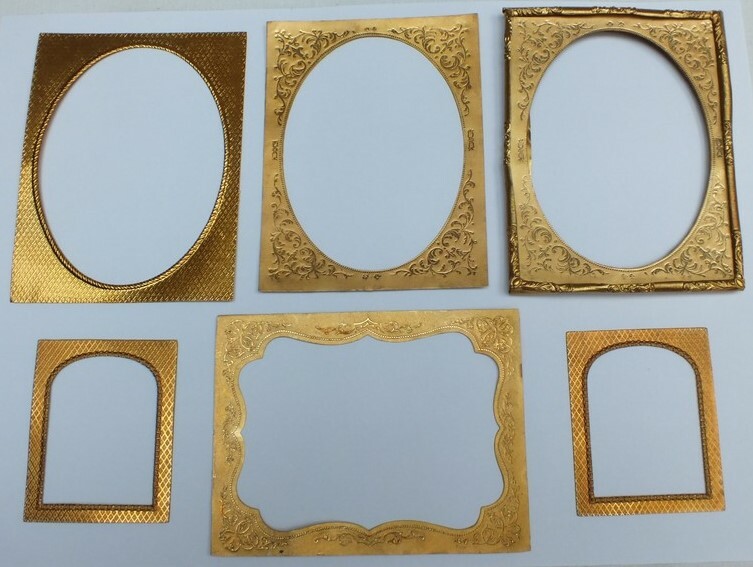 Sandwiched between the glass plates was a thin piece of metal known as a mat or passe partout. These came in various designs and were normally machine-cut. The 'Bronte Sisters Photo' doesn't have one of these ornate mats, it has been cut out of a piece of metal by hand. Hand-cut mats are surprisingly rare. Straight - Concave - Uneven. What is thought to be the earliest photo in the Bronte Parsonage Museum also has a rough hand-cut mat and a similar pinchbeck frame but in the 1850s machine-cut mats were widely available. In the Parsonage photo the right edge of the mat is straight, the opposite edge slightly concave, and the other two are uneven. The 'Bronte Sisters Photo' is cut in exactly the same way except that the straight edge is on the left and the concave side on the right. This is unlikely to be a coincidence. ABOVE: The Bronte Museum's photo of Haworth Parsonage c1857 and the 'Bronte Sisters photo' with similar hand-cut mat and frame. Hand-cut mats are not often seen in 1850s photos and where they do exist they are usually straight. 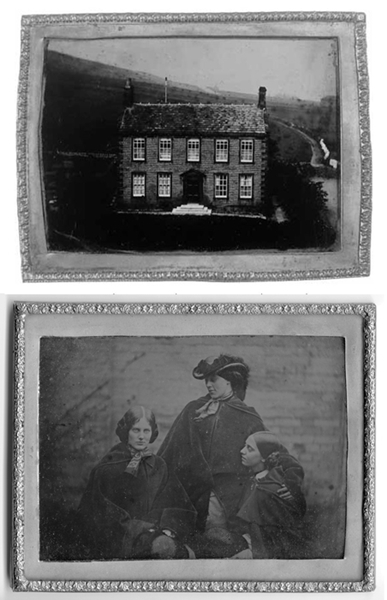 The two mats are not only badly cut, but badly cut in the same manner; as both appear to be Bronte-related they were almost certainly taken by the same photographer about 1857. There is a grey cast to the 'Bronte Sisters Photo' which is more noticeable when compared to other contemporary photos. This lack of tonal range and contrast, and the fact that it isn't level, is a sign that it may well be a copy of an earlier photo. Ann Dinsdale at the BPM allowed us to compare the two photos in 2012 (see the image below). Did John Stewart take both photos? It is possible that the two photos were taken by John Stewart on his visits to Haworth in 1856-7. He visited Haworth for two reasons. In November 1856 he made three photographic copies of the 'Richmond Portrait' of Charlotte for Mr Nicholls. Early in 1857 he returned to take a selection of views of Haworth for Elizabeth Gaskell. Stewart lived with his family in the South of France and returned there sometime after January 1857; the 'Bronte Sisters photo' was discovered in France a few years ago. Another connection with France is Elizabeth Gaskell. In March 1857, after completing her biography of Charlotte Bronte, she travelled to Paris and visited her friend Mary Clarke Mohl. Detail of the earlier writing on the backing paper which reads "Soeurs Bronte." 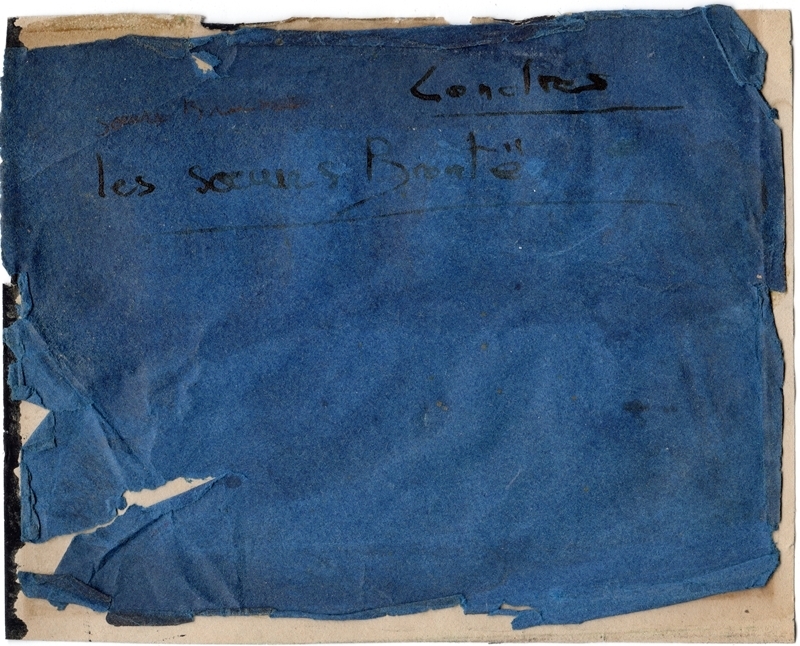 To the top left of the backing paper the words "Soeurs Bronte" are written in pencil. It has been suggested that this is was not written by a French hand because of the omission of "Les." Just above and below this are indistinct marks which may or may not be faded writing, or impressions from writing. Detail of the later handwriting on the backing paper which reads "Londres" and "Les Soeurs Bronte." At a later date someone has written "Londres" and "Les Soeurs Bronte" in ink but they had difficulty spelling the word "Soeurs" which again suggests that this wasn't written by a French person. If these are the Bronte sisters then "Londres" (London) will not refer the location as only two sisters are known to have visited the capital together at any one time. If this is a copy made by John Stewart of an earlier photo then it would probably be for George Smith in London. 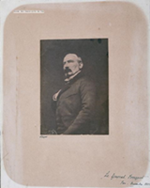 A paper print from this photo may have been in London in the early 1860s because there are similarities with Frederick Walker's watercolour, commissioned by George Smith in 1863. The backing consists of three layers of paper: black, cream and blue. The earlier writing in pencil is to the top left. The words "Soeurs Bronte" scribbled onto the paper do not provide enough information to make comparisons with John Stewart's signature or handwriting althouh they might be compared to any surviving scribbled notes. It is not known who added the later label in ink but for some reason the letters are (mostly) not joined up. The differences in style, omission of "Les" in one title, and the difficulty in spelling "Soeurs" in the second, suggest that they were written by two different people who were probably not French. In the only sample of John Stewart's handwriting seen so far there are grammatical errors. The example below was written in 1855 and the acute accents have been missed from the words Général and décembre.1. Handwritten title of a photo by John Stewart: "Le Général Bosquet, Pau-Décembre 1855"
© Le Musée des Beaux-Arts de Pau. The photo with the title "Le Général Bosquet, Pau-Décembre 1855" to the bottom right. The earlier writing on the reverse of the Bronte Sisters Photo which reads "Soeurs Bronte." Just below this are indistinct marks which may or may not be faded writing. A French handwriting expert should be able to throw more light on the subject. The indistinct marks on the blue paper, which look like impressions made from writing, could also be investigated. 1. In the French language months of the year are not normally capitalised but here it forms part of the title of the photo.